An Australian or New Zealand meat pie is a hand-sized meat pie containing largely minced meat and gravy sometimes with onion and often consumed as a takeaway food snack. The pie itself is congruent with the United Kingdom's steak pie. 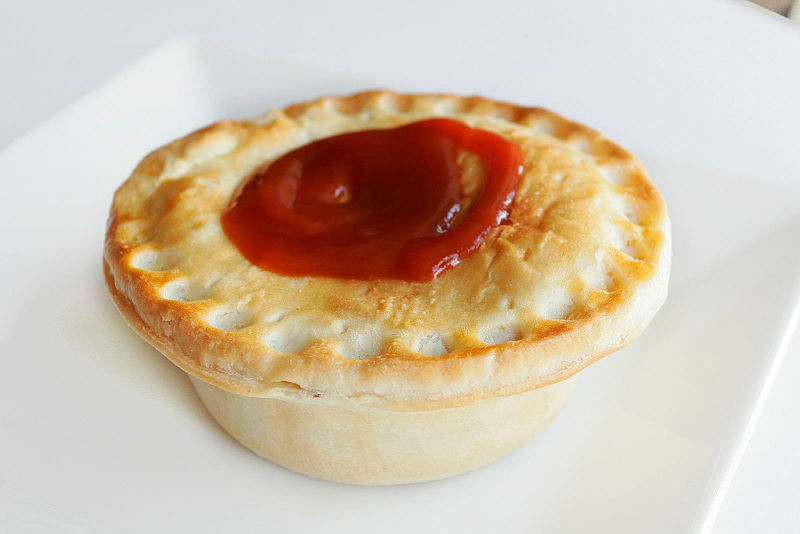 Left: A typical Australian meat pie with ketchup. It is considered iconic in Australia and New Zealand. Across the Tasman, New Zealanders regard the meat pie as a part of New Zealand cuisine, and it forms part of the New Zealand national identity. The meat pie is heavily associated with Australian Rules Football as one of the most popular consumed food items whilst watching a game.